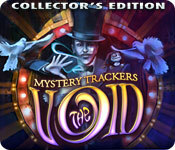 Mystery Trackers: The Void Collector's Edition is rated 4.3 out of 5 by 27. Rated 5 out of 5 by jmcbeauty from Great start of series I really enjoyed going back and playing the demo of this game after checking out Mystery Trackers: Black Isle. The storyline of spooky house, missing characters and finding out what happened was an entertaining and bringing you into the story premise. The hos were a little challenging as some of the objects are on the small size but not so challenging that you get frustrated in trying to find an object. Also the mini games were also fairly simple and did not have to or want to skip. The scenery was really nice and the appropriate amount of "darknes" for the ambiance was well done. The path through the house is easy to follow (it doesn't give you a whole lot of choice when where you entered closes on you), but found the whole demo definitely enjoyable and will at some point in time purchase. 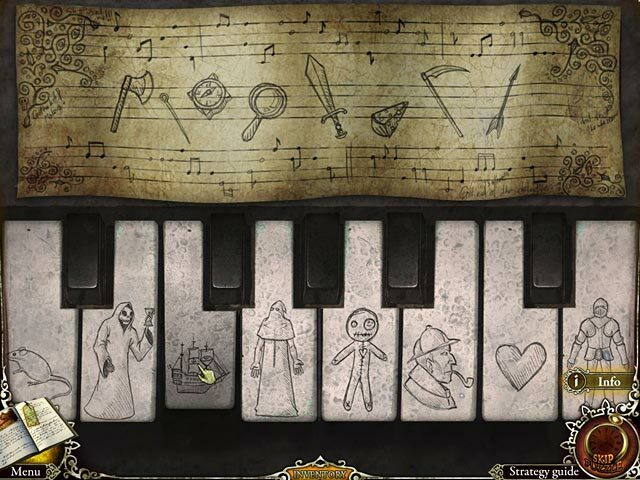 Rated 5 out of 5 by rebel42 from Creepy Fun Game This game had a good story that kept me interested, beautiful art work, very good music and sound, and lots of puzzles in addition to many hidden object puzzles. The puzzles were of various difficulty which I think is a great idea for keeping it lively. I highly recommend this game. Rated 4 out of 5 by debbie_candy from if all mystery trackers games are like this one, hurray! excellent game! liked the puzzles, the hog scenes and the effects! amazing! Rated 4 out of 5 by SueSleuth from Kept me entertained I like this game fine. The story was a little out there, but that just made it more interesting to find the clues and solve the puzzle. Rated 4 out of 5 by neilskinut from not great but good Not sure if it is CE worthy. The HOS are really good. Hard to see them all. BUT there is too many of them for me. Puzzles are good. No voice over. You do have to find things and not too much running around. Just not much of a adventure for me. Pretty simple game and straight forward. Rated 4 out of 5 by RastaPasta from Not My Favorite, But Not Bad Either This wasn’t a bad game at all. The graphics were good and I liked the storyline. I thought that the level of challenge was decent enough, and there were some humorous moments as well (when you eventually open the mailbox in front of the hotel, there’s a little teddy bear with beady orange eyes and green teeth that sings a funny little song… which I listened to a few times). Although I have nothing against the occasional puzzle and/or HOS, this game (Imho) went a bit overboard. I found myself having to take numerous breaks, because the sheer number of them really started to get on my nerves. (38 HO scenes and I believe an equal number of puzzles). Now if HO scenes and puzzles are something that you feel passionate about, then this game is suitable to put on your “must have” list. The fact that I (obviously) don’t share the same fervor for so many of them doesn’t make this a bad game at all. It just means that they (puzzles and HO scenes) aren’t my favorite things to do. I haven’t played the bonus content yet (I have to take another “break”) but all in all I still think that The Void is a decent game and so that’s why I gave it the rating that I have. Rated 4 out of 5 by lisanti from Must love HOS I enjoyed this game for most of the time I played it, but by the end, my heart sank every time I saw the sparkles for a HOS. I like HOS and mini-puzzles, but this game,IMO, went a little overboard. I would have sworn there were hundreds, so I went through the walkthrough to find that there were 37 HOS and 38 puzzles (I may have missed a couple), many of which were back-to-back: you'd finish one HOS, back out, and face another. If you really, really love HOS, this is the game for you. The story is interesting, and I did enjoy the adventure parts - the figuring out what to use and where - but they got smothered by the HOS and puzzles. The next two Mystery Trackers games (Raincliff and Black Isle) are much more balanced between HOS, puzzles, and adventure. Rated 4 out of 5 by Mrs_Kim from totally Hidden Object Game For totally HOG lovers, this game is for you! there are a lot of hog scenes here, almost in every scene and unfortunately they are basically junk. The graphic is nice, but not superb and I understand this is the first installment of Mystery Trackers series so I didn't expect too much from it. However it's fun and there's not much backtracking which is nice. I spent 2,5 hours to finish 6 chapters, only 2 left plus the bonus game if I refer to the strategy guide so I assume this game is short. Rated 4 out of 5 by Adreah from Interesting It's not really a horror story, but hey, at least it was very enjoyable to play. I found very funny the reference to Stephen King as one of the victims. PROs: Colorful graphics, easy to play. CONs: Too bad I felt it very short. It could have lasted a little bit more. Rated 4 out of 5 by indiasnowden from Just finished and totally enjoyed every minute I have not played any games in months so I decided to use my eight credits before year end. I chose this as one of the games. The play is very intuitive and I found that even though I deviated from the SG I still found everything and its all good. So, the gameplay is flexible. The graphics are nice. Music is okay, I turned it off but only because I prefer to play without/with depending on my mood. Special effects sounds are good and appropriate to the situation. Story line is great and the ending leaves you thinking there will be a sequel. Which I am looking forward too. I found the game a little short. The bonus play in the CE helps to fix that however. The bonus play was excellent. I have not looked at the extras so I cannot comment on those. I probably will buy the standard game next time; game play is too short for me to justify the CE price. I did enjoy playing this game and would recommend it as long as you are okay with a slightly shorter gameplay. Rated 3 out of 5 by ChristinaX9 from Nice for beginners This was really not a bad game, with nice graphics, sound and a promising storyline. Three celebrities have disappeared in a mansion and you are tasked to find them. The game has many different areas to move around, although I did prefer the ones inside the mansion as they are more creepy. 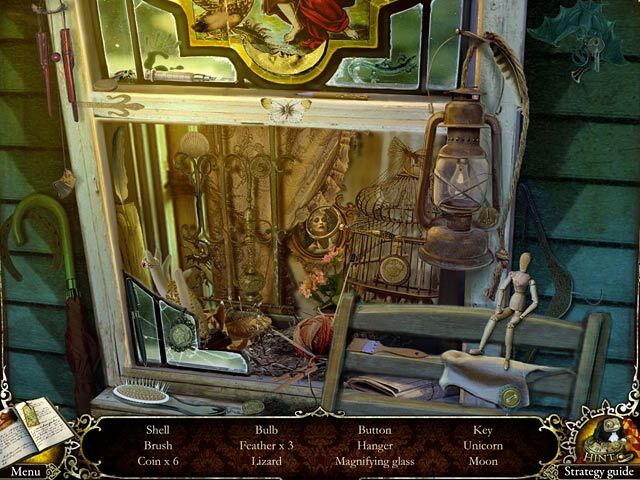 There are hidden objects galore, some really pretty others more obscure. There are also extras in the CE edition such as an extra chapter. My favourite part of this game is that there are tons of puzzles, however the majority are on the easy side (all except 2 or 3) so this game is more suited for beginners. Rated 3 out of 5 by EHinSF from Really not that great I bought this game because I liked the other Mystery Trackers games so much, but I made a mistake. This one isn't as good as the others. To make it worse, I spent twice the money and bought the CE. There are lots and lots of HOS, but they are simple and because there are so many, it detracts from the storyline. The strategy guide isn't even really needed because of the game's simplicity. Also, the story doesn't make much sense. I'd only buy the SE game if I really loved HO games of this genre and check out the other Mystery Trackers first. Rated 2 out of 5 by jivins11 from Review of Free Play Only I sort of liked the first episode of this game, so I thought I'd try out the second one. This one is okay? The plot had a lot of potential but it was not executed very well. The HOP puzzles were old school, which isn't surprising given the age of the game, but the other puzzle types were fairly easy and very straight forward. The graphics were good, again for the age of the game, The music was okay. Overall, I was not impressed and will not be purchasing the full version. However, the story seemed like it could be interesting, so I'm going to give the next game in this series a go. Hopefully, the game makers improved with time as there was a lot of potential here. Rated 1 out of 5 by elliebrezy from The Void Terrible, I got so far and then this stupid "mini game" (why are they there anyway) and no instructions. No chance to "skip" the games because they are not about the "bhidden object " games. 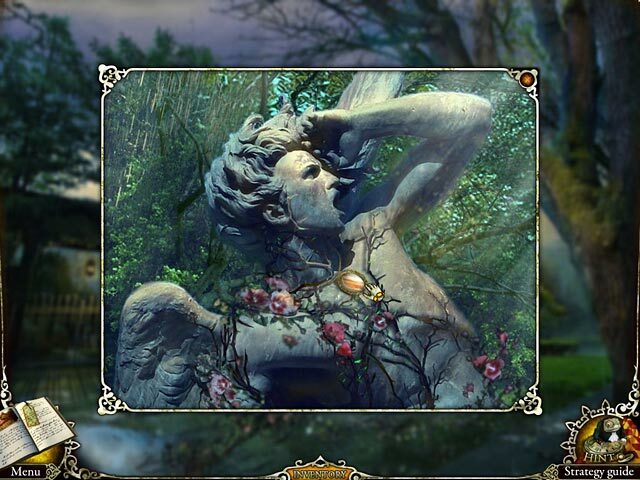 There is no "hidden object" involved in these mini games so why do we waste out time there. I would buy more games but for the mini games. For example, another game "Hollywood Files - Dealdly Intrigues" I can't get off page One. "Return to the Titanic" I can't get off Page One it's all scrambled, no letters, all scrambled. I have spent an hour on this computer trying to get one game going and nothing. One game I downloaded it said "game over" I never played it ever. Come on, I know u hv a lot of customers, but to get more new ones you must let us try not daily but some games that I get "game over" has to be over two years ago and I don't remember the games. Hidden Objects should be just that and no more. Twelve or more objectst at the bottom, find and enjoy. Checking out "free games" and more - no gimmicks.